A few years ago, all the girls in our family got together for what we call “sisters weekend”. We decided to put these jars together to give as Christmas presents! I had never heard of a cookie called “Hootycreek” but it’s fantastic! The cranberry makes it taste (and look) so Christmassy! And these jars make great teacher or pastor or BFF gifts! This first part is the actual recipe to make the cookies. The second section below is how you make the jars and what the card you attach to them should say! Enjoy! Combine flour, baking soda, salt and cinnamon. Cream butter, then add sugars, eggs & vanilla. 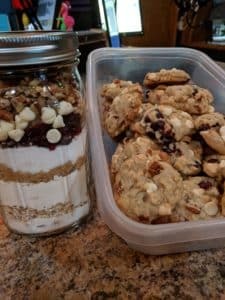 Mix in flour mixture & oats, then cranberries, chips & nuts. Drop by spoonfuls on greased cookie sheet. Bake at 350 for 8-10 min.